Thirsty Pilgrim: Mysterious Belgian Bar Snacks, Part III: Choesels. Mysterious Belgian Bar Snacks, Part III: Choesels. It's been a quick five years or so since I posted a couple of entries in a hypothetical series called Mysterious Belgian Bar Snacks. Then this choesels thing came up. A long-delayed sequel, like the Color of Money and Wall Street II: Gecko's Revenge, or whatever that one was called. A disclaimer, in the tradition of long-delayed sequels that are inconsistent with their predecessors: Choesels are not really a bar snack. I mean, they could be, but like many weird old peasant foods they're more easily found in upmarket restaurants that pay attention to local traditions. On the other hand, they would traditionally be accompanied by beer--lambic, most likely, because this is an ancient Brussels thing. So, choesels! What are they? I asked that very question some years ago at Restobières. And the waiter told me they were bull's balls. Well, how do you say no to that? Especially in the presence of friends and/or loved ones who (a) know you will eat pretty much anything and (b) heard the question and answer. So, the other day: I'm scribbling something about Brussels food and come across choesels again. And I remember: bull's balls. Then my journalistic skepticism--a ponderous burden for anyone trying to make money by selling words--kicks in. And I think, really? Bull's balls? For real? Because journalistic skepticism sounds like that sometimes. So I spend more time than I should have googling around and learning that sometimes they could be pancreas or other bits and ends of the cow. In fact, the choesels were the meal of poor people. It is an old custom. It was a mixture of different parts (breast of veal, oxtail, heifer sweetbreads, calf testes and pancreas) of beef. In fact, Gaston Clément (1879-1973) a famous Belgian chef ([royal] chef of the Belgian crown) published a recipe of the choesels in his book (1954) within included pancreas and testes. In 1899 and 1903, Jean de Gouy wrote in the 9th ed. of his book, La cuisine et la patisserie bourgeoise, that choesel is pancreas. Miss Lucas, a famous Brussels chef, has never used pancreas in the recipe of her Choesels. My opinion of this issue is that Choesels is a traditional meal and everybody can realize them with [their] personal touch. Personally, I do not put pancreas in my recipe, but [just] testes of veal. I hope that it is now clearer for you. A recent frustration: I had lunch at Restobières last summer without taking a single photo that was worth a damn. So instead you get an image of his cookbook, La Cuisine à la Bière, which is hugely entertaining if your French is up to it. Choesels are in there. Rocky mountain oysters, Belgian style, and Fayt typically does it with lambic from De Cam. 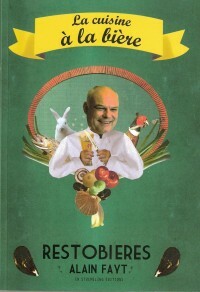 You can buy the cookbook at his restaurant. I was traveling in Belgium by bike in 2012, visiting breweries and bars and tasting a lot of beer. Many bars offered a little bowl of salted peanuts (mixed with some other stuff) free with the beer. I've just spent a year brewing/fermenting a kreik at home, yes - geuze, wild yeast and all - and I'd like to recreate the moment when I first had a kreik in Brussels. As a guru for mysterious Belgian bar snacks, I am hoping you can tell me what is in that little snack aside from the peanuts? Well I've seen a variety of different nut mixes in Belgium. Sometimes the peanuts are coated in a sort of spicy cracker crust, tasting of either wasabi or cayenne. Those are the ones to eat. I'm not sure where to get them, probably any Belgian supermarket, but I'd think you could find a reasonable local substitute. The easiest and simplest and most true-to-Belgium bar nibble you could employ is small cubes of young Gouda sprinkled liberally with celery salt. More Fancied Beer, Less Fancied Prices.